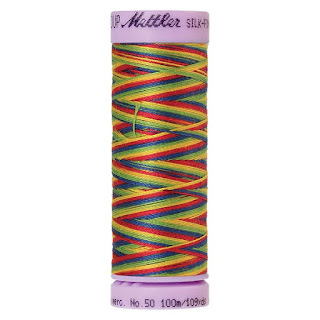 Pelenna Patchworks: Newly expanded range of Mettler Silk Finish threads now available! Newly expanded range of Mettler Silk Finish threads now available! After a few months of stock problems while Mettler re-branded their range, we now have a huge range of colours available in the various Mettler Silk-Finish thread collections. We have Silk-Finish 50 sewing thread ideal for piecing and general dress making, Silk-Finish 40 quilting thread which is a heavier weight ideal for quilting and special effects, and Silk Finish Multi 50 which is a range of multicoloured and variagated threads great to create eyecatching designs and colourful patterns. We also have the most popular solid colours on larger reels, perfect for larger projects!